Since time immemorial, we. The Gitksan and Carrier People of Kitwanga, Kitseguecla, Gitanmaax, Sikadoak, Kispiox, Hagwilget and Moricetown, have exercised Sovereignty over our land. We have used and conserved the resources of our land with care and respect. We have governed ourselves. We have governed the land, the waters, the fish and the animals. This is written on our totem poles. It is recounted in our songs and dances. It is present in our language and in our spiritual beliefs. Our Sovereignty is our Culture. Our Aboriginal Rights and Title to this Land have never been extinguished by treaty or by any agreement with the Crown. Gitksan and Carrier Sovereignty continue within these tribal areas. We have suffered many injustices. In the past, the development schemes of public and private enterprise have seriously altered Indian life and culture. These developments have not included, in any meaningful way, our hopes, aspirations and needs. The future must be different. The way of life of our people must be recognized, protected and fostered by the Governments of Canada and the Laws of Canada. Only then will we be able to participate fully in Canadian society. We, the Gitksan and Carrier People, will continue to exercise our Sovereignty in the areas of Education, Social and Economic Development, Land Use and Conservation, Local and Regional Government. We have waited one hundred years. We have been patient. 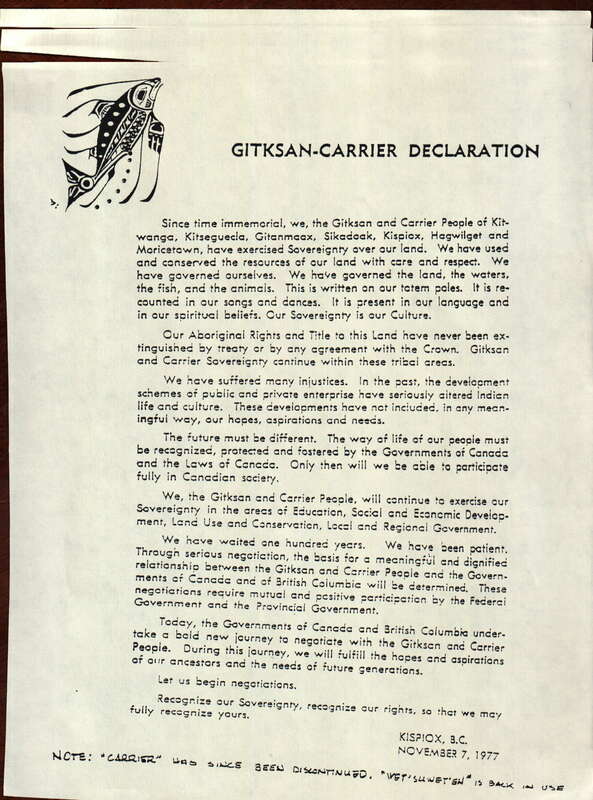 Through serious negotiation, the basis for a meaningful and dignified relationship between the Gitksan and Carrier People and the Governments of Canada and of British Columbia will be determined. These negotiations require mutual and positive participation by the Federal Government and the Provincial Government. Today, the Governments of Canada and British Columbia undertake a bold new journey to negotiate with the Gitksan and Carrier People. During this journey, we will fulfill the hopes and aspirations of our ancestors and the needs of future generations. Recognize our Sovereignty, recognize our rights, so that we may fully recognize yours. Note: since this Declaration it has become usual to use the name “Wet’suwet’en” instead of “Carrier” in the case of the houses which allied with the Gitxsan in the Delgam Uukw court action. Whereas we of the Carrier and Sekani Tribes have been, since time immemorial, the original owners, occupants and users of the north central part of what is now called the province of British Columbia and more specifically that area of the said province outlined in red contained in the map attached hereto as schedule “A” [herein referred to as “the said lands”]. And further we hereby demand of the governments of Canada and British Columbia compensation for their past, present and proposed use and occupancy of our lands and all its resources.